Most of us spend about a third of our lives in bed and doctors tell us that the quality and quantity of our sleep is a major contributor to our health. Experts say that the best setting for sleep is in a dark, quiet room with a cool temperature – and a comfortable mattress. Conclusion: we should be sleeping on good mattresses and mattress pads. There are start-up companies that offer new options – not just in mattress construction, but in how we purchase them. They are, as a group, called ‘Bed in A Box’. Here’s why. Introducing comfortable, reasonable ‘Bed in A Box’ mattresses. There is a new generation of foam and latex mattresses which do not require box springs. You order online, and the mattress is delivered in a box which looks like it should contain a couple of sleeping bags. No big delivery truck and no movers. These mattresses are generally about 10” high, made from layers of foam and designed for use without a box spring. Make sure that your headboard will work with this low a mattress and that you like the modern look. Many companies are making them. 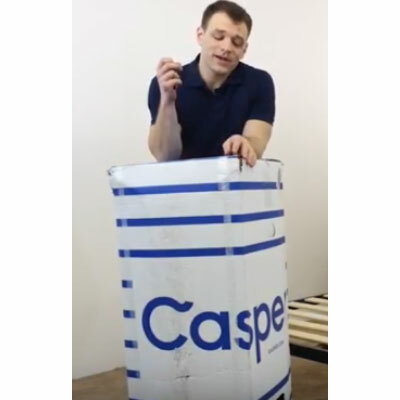 YouTube of a Casper Mattress being opened. What to look for in a mattress? Side and stomach sleepers tend to prefer soft mattresses and back sleepers go for firm mattresses. Guest room beds should have something in between. I am ordering mattresses for a guest room. In the old days, I would have gone to a showroom and laid on mattresses. No more. Here are some mattresses that you can order online. 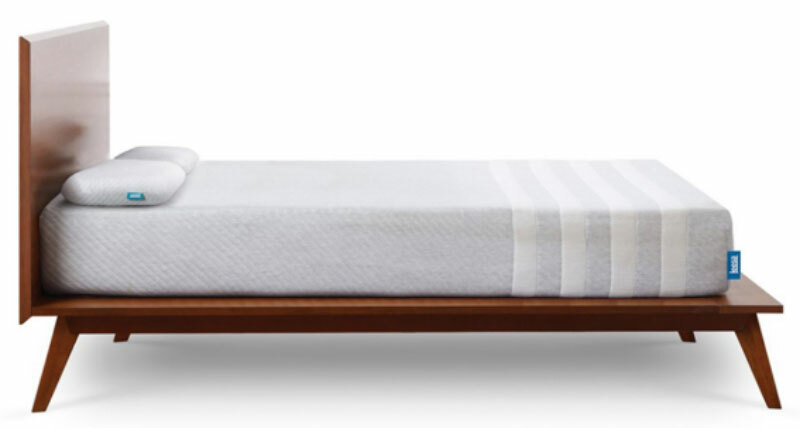 The Wirecutter tested over 40 of the new foam and latex mattresses and recommends the Leesa Mattress for cooling, body contouring and pressure relieving support – for back and side sleepers. It has three layers: comfort, recovery and base support. The total height of the mattress is 10” so make sure that it works with your headboard. Leesa Queen, $995. Note: The Leesa has support all the way to the edges, so it is a good choice if you have two twin beds that you sometimes push together to make a king. Leesa donates one mattress for every ten it sells. You can lie down on a Leesa at a West Elm store. I have slept on a VERY comfortable Casper mattress. Wirecutter recommends it for all round back, stomach and side sleeping. It has four layers: one is high-density memory foam, topped with a light layer for comfort and supported by a base layer for support – all with an open cell layer on top for breathability. As you can see in the image there is more support under the hips. It is 10” high. Great customer service with a real person. The Casper Queen, $995. You can try out Caspers in their stores. Note: Casper has a sense of humor. While I was on hold with customer service, I learned loveable sleep facts: otters hold hands when they sleep so that they don’t drift apart and dolphins sleep with one eye open. There is a generous return policy and Casper donates returned mattresses to people who need them. 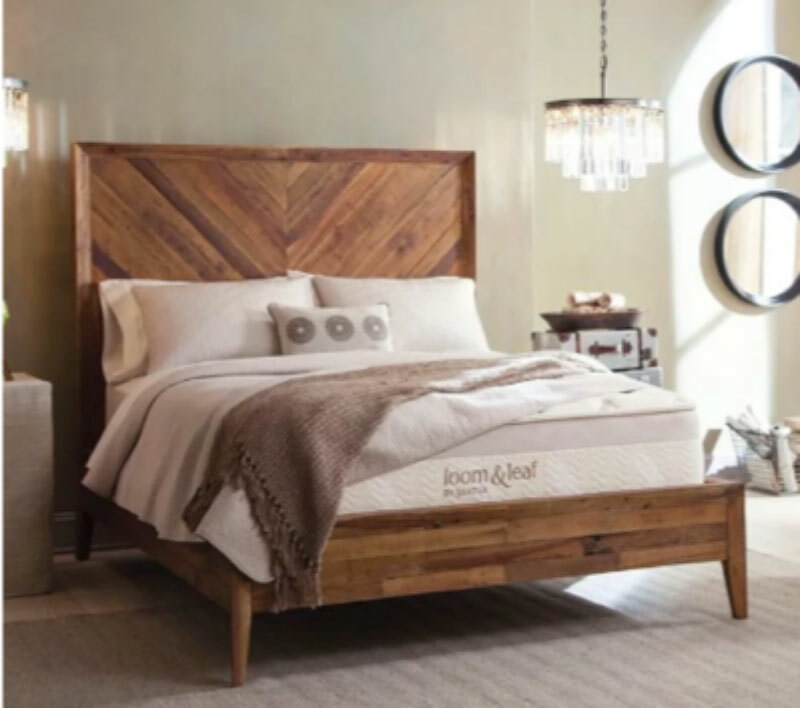 Loom and Leaf is a premium memory foam mattress, made in America by the Saatfa mattress company. Is has four layers including a cooling organic cotton and flame-retardant thistle top layer. There is a 2” layer of conforming gel foam. There is a gel laminating material in the lumbar region to support the lower back and a high-density base. Loom and Leaf review. Loom and Leaf Queen, $1,299. 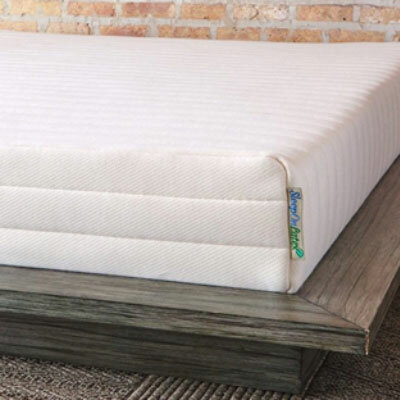 Pure Green’s Latex mattress by SleepOn hugs the sleeper less than its foam cousins and sleeps ‘cooler’. It still gives good support. Natural latex comes from the rubber tree. Pure Green Latex Queen, $795. I think of Tempur-pedic as the original luxury foam mattresses. The mattresses are a more traditional height than a ‘bed in a box’ and they are extremely comfortable. They are expensive and very heavy – requiring a delivery truck and movers. Delivery is free. 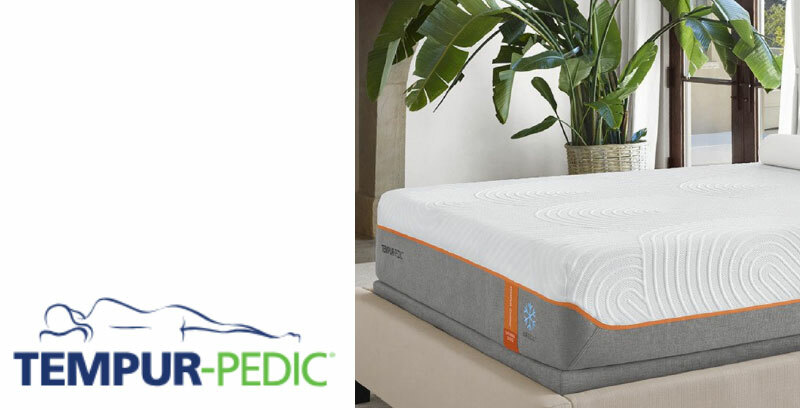 Tempur-Contour Elite, Queen $3,749. Note: I use their 3” thick toppers on top of some older mattresses and they are very comfortable. They also transform a dorm room bed. Tempur-Topper Supreme, twin, on sale for $224.25. Traditional luxury mattresses, updated by Four Seasons and Simmons are available by calling any Four Season’s Hotel. The Four Seasons Hotels have made the ‘sleep experience’ the core of their excellence. Their signature beds are famous. You can buy their mattresses and pads for your home. They have an innovative GelTouch Foam Center to keep you cool. The pocketed coils minimize motion for partners when one moves. There is a choice of three zip-on mattress toppers – regular, plush and firm. You pay a premium for the Four Seasons brand, but you will be certain that you have chosen a comfortable mattress without any shopping. The Queen mattress set (mattress, topper and box spring) is $2,599, $2,199 without the box spring. You order your mattress through any Four Seasons Hotel. The Four Season Bed. Tip: Make a king bed from two twins. I am putting two twin beds into a guest bedroom. For flexibility, I have purchased this foam ‘bed bridge’ so that when I push the beds together, I can make them up as one king bed without a gap in the middle. 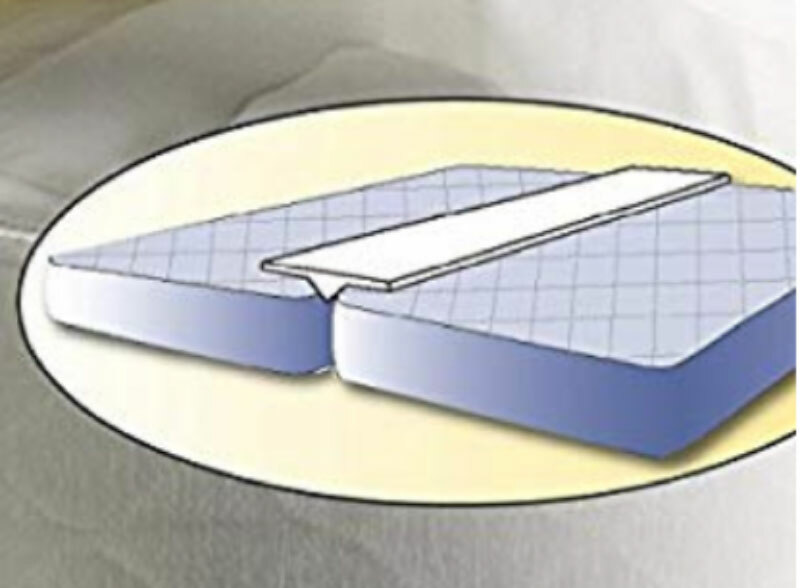 This is also helpful if two sleepers prefer very different mattresses – back sleeper meets stomach sleeper. Each can have the perfect mattress in one king bed. Note: I like to put a mattress topper over the foam bridge. Foam Bed Bridge Pad, $19.99. ASE Article on new bed linen options. ASE article on buying new sheets. ASE article on sleeping well.